Last Christmas my brother Paul gave me a present of a large ceramic flower pot, covered in stones with an imperative to “water regularly”, which I obediently did. In early spring, I noticed the stones seemed disturbed, followed by crater-like clay bursting through the stones. By Easter there emerged beautiful purple Hyacinths. Previous reflections on the parable of the Sower and the Seed in Mark’s Gospel was always on the aspect of the soil rather than the nature of the seed. 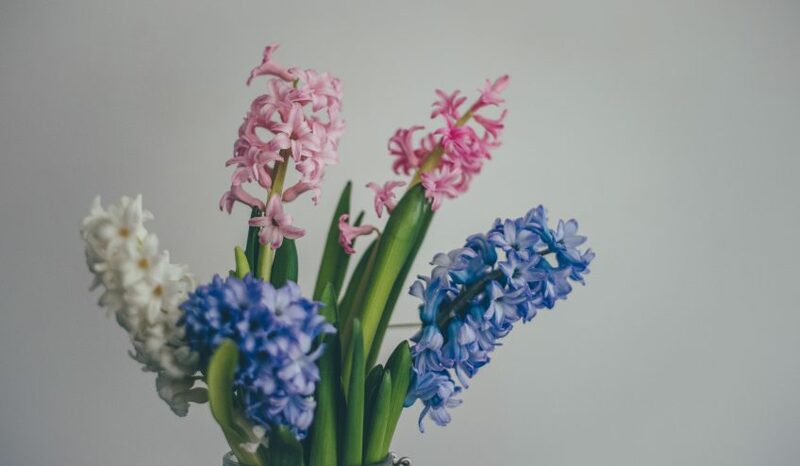 However, when considering those Hyacinths as tubers or other flowers as seeds, I’m struck by their innate sense of knowing what to do. These seeds uncontaminated by an ego, humbly obeying their true nature and true calling – what a metaphor! The following is a reflection on the ‘hidden treasure’ found in the deep soil of a field full of ‘seeds’. In my reflection about the seeds, I recognised that when facing difficulties in the past involved coming face to face not only with fear but also with the ego-self with its pride, and willfulness. Accordingly, one of the critical aspects of any challenging journey is knowing that “it is the imperial ego that has to go and only powerlessness can do the job”  – in a word ‘ouch’!! However, reaching this ‘powerlessness’ is a process in and of itself. It’s a process which mines for the hidden gems triggered by current dilemmas. Is it any wonder Paul stated: “Be transformed by the revolution of your mind” (Romans 12:2)? Is it any wonder we avoid it? Scripture and prayer reveal that we can trust the process. Yet, in spite of this experience, trust in and of itself is still something we grow into rather than a mental exercise where one simply makes a conscious decision. What random acts of kindness did I do today? What positive feedback did I receive today? What were the moments of good fortune? What experience gave me pleasure (small/big)? Having written my diary all week, guided by these headings, I was amazed to see the gems of wisdom, hidden in the daily normality of each day. At week’s end, having re-read what I had written, I could see the subtle tapestry of grace woven through each day and how God had been shaping my life, throughout all my relationships and activities. Subtleties I would have missed had they not being captured by my writing. It was like listening to those seeds engaged in their growth, so hidden and yet overt was God’s grace. I would like to conclude with an excerpt from another poem by John O’Donoghue knowing that in each of our journeys, we too are breaking through the stones, the dark of the clay, knowing that the bloom will appear in its own time, guided by grace and in accordance with God’s plan. Richard Rohr, Breathing Under Water: Spirituality and the Twelve Steps, (Cincinnati, Ohio: Franciscan Media, 2011), 4. John O’Donoghue, “For the Interim Time” in Benedictus, (Bantam Press, 2007), 134. Rohr, Immortal Diamond: The Search for our True Self, (London: SPCK 2013), 25. O’Donohue. “For a New Beginning”, in Benedictus, (Bantam Press, 2007), 33.